The British Army has engaged in many heroic actions over the years but few have achieved such legendary status as one during the Crimean War in October 1854. This action, described by The Times reporter present as ‘an atrocity without parallel’ came to be known as The Charge of the Light Brigade and moved the former Poet Laureate Alfred, Lord Tennyson to write a poem so titled. A breakdown of communication between senior Army commanders led to Lord Cardigan leading five regiments of British cavalry on a heroic but suicidal charge against massed Russian artillery. The charge was looked upon by Victorians as an heroic failure and an icon of self sacrifice. Three Warwickshire troopers took part in and survived the famous charge. 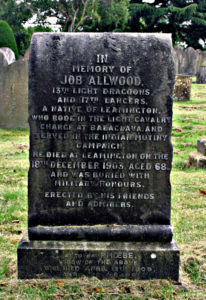 One of them, Job Allwood was a local man who is buried in Leamington Cemetery. Job was born in Leamington in 1835. He and his father and his two brothers were canal boatmen and were living at 2 Oak Cottage when the 1851 census was taken. Two years later, Job a fresh-faced lad of eighteen enlisted into the 13th Light Dragoons with whom he served in the Crimea, seeing action in all the major engagements of the war and having two horses killed beneath him in the charge at Balaclava. 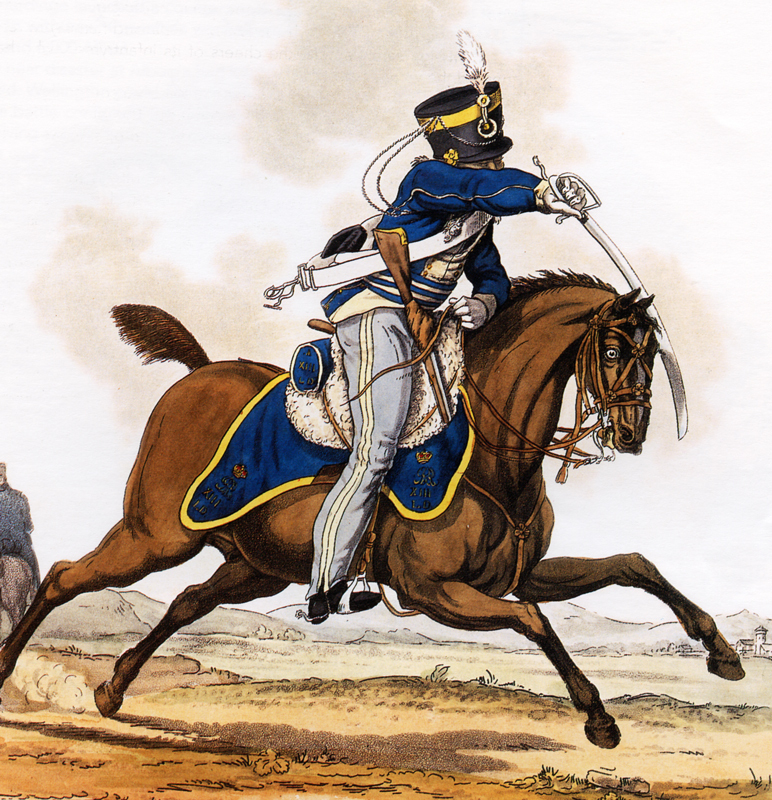 He subsequently transferred to the 17th Lancers and was discharged as ‘time expired’ in November 1865 having served with the colours for almost twelve years. Following his discharge he lived in Waterloo Street in Leamington and married Phoebe Harridan. His health was very poor, principally as a result of his Army service and he suffered from bronchitis and chronic rheumatism. He found employment as a groom and a coachman in north Leamington, a fitting occupation for an ex-cavalryman but like many of his former Army colleagues, life was very difficult financially. In 1890 he was granted £15 from the Light Brigade Relief Fund which was set up for totally destitute survivors. Towards the end of his life, he and Phoebe were offered a home at 20 Morton Street, an alms house belonging to the Soldiers and Sailors Help Society. His income was fourteen shillings a week, made up of one shilling and three pence a day from the Balaclava Fund and a ‘special pension’ of nine pence a day from His Majesty’s Government. 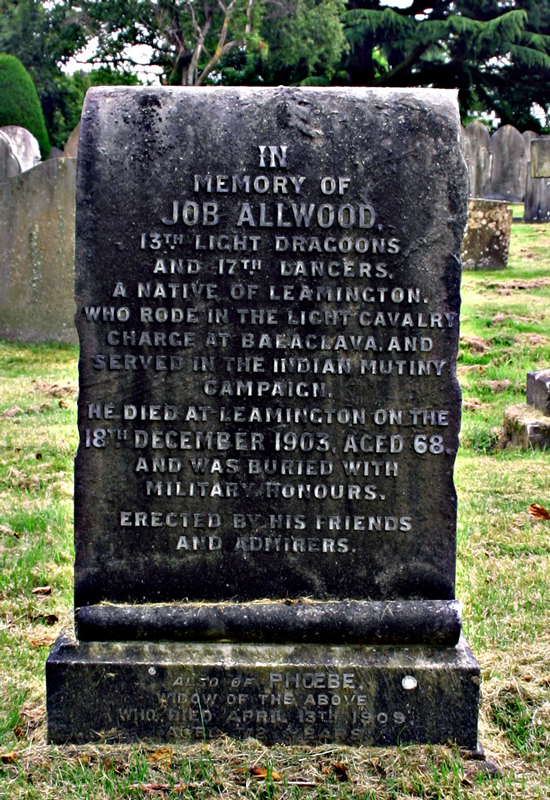 He died at Morton Street on 18th December 1903 at the age of sixty-eight and was buried in Leamington cemetery with full military honours and bands playing. Many hundreds of people lined the route to the cemetery and flags were flown at half mast. A headstone was erected by friends and colleagues who had served alongside him when in Tennyson’s words ‘Boldly they rode and well, Into the jaws of Death’ on that fateful day fifty years earlier. There were no children from his marriage. His medals were advertised for sale in the magazine ‘Bazaar’ in May 1910.